If you ask someone what American Beauty, Fight Club, The Matrix, Office Space, The Boondock Saints, and Being John Malkovich have in common, they’ll probably either say they have no idea, or they’ll stare at you for a moment before walking off in a daze. Given some time to think, though, it becomes clear that all of these game-changing films seemed to focus on the same general premise of middle-aged male desire. And weirdly, they all hit theaters the same year. 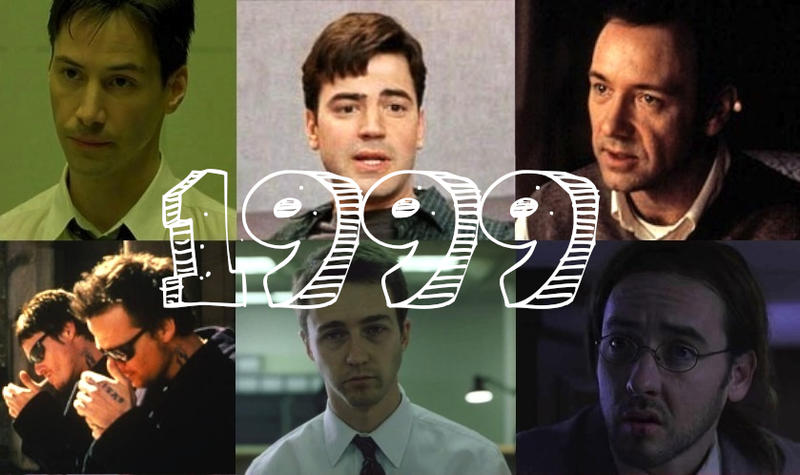 You heard that right – every one of these films came out in 1999. Dubbed “The Year that Changed Movies” by Jeff Gordinier in his article for Entertainment Weekly, 1999 was a landmark period in the world of filmmaking. More than just the sudden advent of fantastic movies that burst on to the scene that year (Galaxy Quest, The Iron Giant, etc. ), boundaries were pushed and conventions were challenged; a new wave of movies (The Blair Witch Project, Run Lola Run) that seemed to echo the schizophrenic attention spans of the millennial generation was born. This was a year that changed the film landscape, paving the way for the more kinetic films many of us are so used to now – look at District B13 (2004), Crank (2006), or even the films of Darren Aronofsky, and notice how drastically they stray from the classic conventions of the earlier 20th century – they all owe a great deal of gratitude to the movies of 1999. “Now you will receive us!” It’s okay, hitting middle age is nothing to be ashamed of – we still love you. All the while, amongst these loud, radical, wild, culture-shocking films, a common undertone issued from the underbelly of cinema. Indeed, more so than the rebellious, young, upstart directors who helmed these films and generally did away with the tropes of the past, these films went beyond sticking it to Hollywood – they stuck it to contemporary American life as we knew it. And that was a message that moviegoers could get behind. Every film listed in that first paragraph begins the same way: the protagonists are stuck in dead-end jobs, and are reaching their breaking point. Then some outside stimulus triggers something inside their brain, and they have an abrupt revelation about the inanity of their day-to-day lives. This epiphany inevitably spurs them to break out of their suffocating shell of drudgery; Neo follows the white rabbit in The Matrix, the Russian thugs attack Connor and Murphy in The Boondock Saints, Lester sees Angela dance in American Beauty, Peter’s therapist never snaps him out of his hypnosis in Office Space, and Craig finds a small door behind a filing cabinet in Being John Malkovich. Lester’s “everyman” fantasy is brought up over and over again. In every case, these epiphanies have a profound effect on the film’s lead character(s), and they are hit with the reality that filing papers all day, or making phone calls, or packing meat, is the extent of their life’s fulfillment. Each one begins to stand up to “the system.” They say “no” to the authorities of society, and declare openly that they’ve had enough. It is difficult to answer where this emergence of antiestablishment comes from. However, if you’ll notice, there is one more glaring commonality among these movies: each stars a male protagonist unsatisfied with his life. Each of these protagonists tends to be middle-aged, and each feels like they’ve wasted their lives working as drones for society. Of course, the films go about portraying their respective leading men’s fantasies in a radically different ways. For example, the science fiction landscape of The Matrix where humans are literally giving their life to “the machine” is a far cry the grounded suburban setting of American Beauty. What is abundantly similar about these movies, however, is that they are all obvious expositions on the universal concept of male mid-life crises. 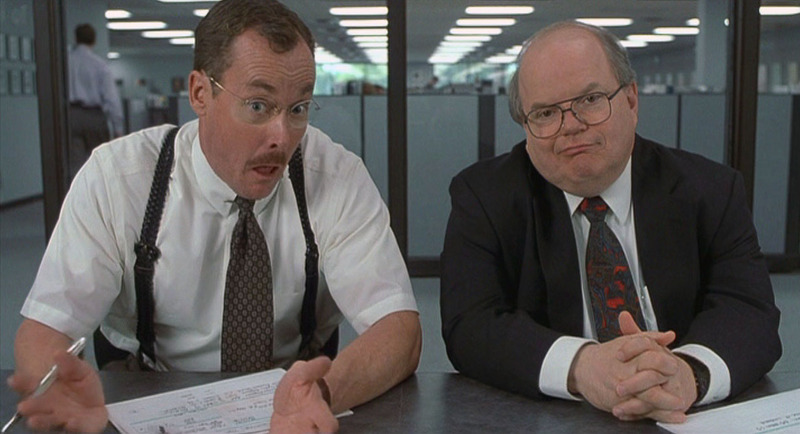 Vented through violent frustration in The Boondock Saints and Fight Club, stylized with fantastical retribution in The Matrix and Being John Malkovich, and played upon in dark overtones in Office Space and American Beauty, this common theme permeated the fabric of some of 1999’s best films. Even Alexander Payne’s debut film Election focused on a middle-aged teacher who finally decided his relatively drab life in Nebraska wasn’t exciting enough for him. Regardless of which films speaks to you, there’s no denying that this was a pervasive message that resonated strongly with the general moviegoing public. For me, the most realistic of these movies is Sam Mendes’s American Beauty. That film’s protagonist, Lester, eschewed the other films’ tendencies toward out-and-out violence, vengeance, and anger in favor of a more resigned approach to dealing with a mid-life crisis: self-improvement. On the other end of the spectrum there is The Boondock Saints, a film whose goal was simply to offer an escapist fantasy of vigilante justice – think of the appeal of Batman paired with a much more violent modus operandi. And then, striking something of a middle ground between the two, is Fight Club, a masterpiece of filmmaking unfortunately saddled with a title that distracted contemporaneous critics everywhere from recognizing its true message. Good for you, man. You should like yourself. So where The Boondock Saints takes a decidedly different approach to the other films in this list by glorifying the decision of Connor and Murphy to murderously rid the world of the hypocrites running society, American Beauty, Fight Club, and Office Space come out with very clear messages about understanding and embracing the minutiae of every day life, boring bits and all. The Matrix and Being John Malkovich both take the high road, concluding in a thought-provoking manner that doesn’t quite address whether resigning oneself to the world of monotony is the right or wrong thing to do. Is he dodging bullets… or dodging his insecurities? In a weird way, Fight Club and American Beauty are almost kindred spirits, delivering a profound message amidst tales of brutal violence, dark humor, and sexual exploration. Both films conclude with simple bits of monologue from their protagonists, and in those final moments we are clued in to the idea of male unrest that Hollywood supposedly managed to detect. Whether this was accurate to the general feelings of the public we may never know, but the immense cult popularity of many of these movies has shown that the market was certainly there. And, as they say, money is the only language that Hollywood hears. Shortly after I posted this article, our frequent guest contributor Mike C showed me a Youtube video that seems to lightly echo my thesis. Enjoy!